Internationally acclaimed Dancehall superstar, Sean Paul hasn’t been fully released yet but already has caused a stir across several continents. Sean Paul released his fifth studio album, Tomahawk Technique in late January, via Atlantic Records (Warner Music Group). This hails as the prominent deejay’s first album since his successful 2009 compilation, Imperial Blaze which earned him a Grammy nomination for Best Reggae Album the following year. Tomahawk Technique was unveiled across various regions such as Japan, Mexico, South Africaand many European countries like Belgium, France, Germanyas well as Switzerland.Since its release, the 12-track album currently holds the eighth position on the iTunes Top Ten Albums Chart in Germany while taking sixth position on charts in Switzerland and Austria. However, its greatest success was in Japan where it topped their iTunes charts within its first week. Currently, it sits at number 10 in the East Asian country. Meanwhile, the first two singles off Tomahawk Technique continue to garner great success as Got 2 Luv U, featuring American pop singer, Alexis Jordan topped the charts in Switzerland while finishing in the top 10 in other European countries such as Germany, Holland, France, Spain and Belgium, amongst others. It currently holds the number 11 spot on the United Kingdom Pop Singles Charts. The album’s second single, She Doesn’t Mind also topped the charts in Switzerland and Japan while also earned top 10 slots in France and Germany, amongst several other countries. 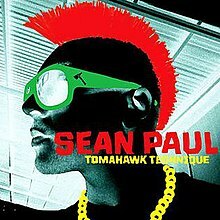 Sean Paul has yet to release Tomahawk Technique in North America but will unleash it in the United Kingdom on March 12. The album also features former Destiny’s Child singer, Kelly Rowland on the collaborative effort, How Deep Is Your Love.